0 - Number of parts that needed to be replaced on the bike...also number of items I had stolen...And number of times I wished I was somewhere else. Best quotes - "Always remember that this is not your destination!" Osamu in Vladivostok while telling me to be careful while wondering around at night. - "Take a good look at it, the next ocean you'll see is in St Petersburg" a man named VMAX while admiring The Sea of Japan from Vladivostok. 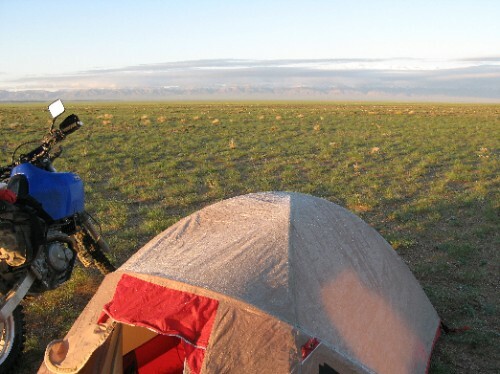 - "You are more than a little crazy I think" a nameless Russian woman at the Mongolian/Russian border who had just heard that I had ridden from Vladivostok. - "I'd love too!" Renee, a little over 1 minute after asking her if she would marry me. - "I will not be long" A very drunk Russian security guard just before taking off on my motorbike. He was very long, mainly due to falling off in the middle of a busy road and having to come and get me to help him pick up the bike. Best meal in Russia - Lunch at Andrey's house in Chita - Roast chicken and salad, pancakes with caviar, local honey and the largest and best cup of tea ever. Best Borcsh - Some cafe between Ufa and Moscow (!) that I didn't catch the name of, I may not know where it was but it was the best beetroot soup I've ever had. Worst gift - Handful of sheep poo offered to me by a Mongolian boy, I politely declined. Best paved road - Mongolian border to Novosibirsk, a very nice paved, twisty road through the Altay Mountains. Best un-paved road - All of Mongolia......I'm going back! Hardest Day - Novosibirsk to Omsk, 600 odd km's where it barely stopped raining, I NEVER stopped shivering and I lost my GPS, accidentally put salt in my coffee, couldn't find a place to sleep until midnight and then thought my bike had been stolen the next morning. Turns out it was just "being looked after" by some drunk Russian security guards. Stupidest thing done - Crashing into the back of a Russian's car about 800km's East of Chita (the middle of nowhere), thank Gorbachev for a market economy! Talked my way out of trouble using Rubles. Best accessory fitted to the motorbike - Heated grips! I am converted! Most useful piece of luggage - Baby powder, no chance of a 900+km day without it! As a bonus it makes changing tyres easier too.